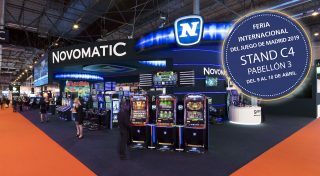 Within the wide offer of the NOVOMATIC brand for arcades, you will find as main innovation the new Gigastar Edition 2, with ten new games including „Batman vs The Joker“, set in the famous Hollywood movie, with innovative mathematics and progressive jackpots. There will also be several configurations of the already known Lotus MG Roulette Pro, and the Impera Salon content in the sophisticated V.I.P. Lounge cabinet, connected to the roulette itself. In the segment of special arcade machines, the Magic Games and Admiral product lines can be contemplated and both will surprise with new content presented for the first time at the Madrid show. To complete the arcade product offer, the GiGames brand will exhibit the “top sales” Chiringuito, now also available in the 3/3000 special arcade version.